Why Invest in a Secure Vinyl Fence in Burke, VA? Why would you invest in a secure vinyl fence in Burke, VA? Many people choose to purchase and install vinyl fencing to surround and protect their property and their privacy throughout Northern Virginia. While their are several reasons cited for selecting a vinyl fence over other materials, the one most often repeated is “maintenance-free,” which is sweet music to any homeowner’s ear. Vinyl fencing is completely weather proof. Easy to install and environment friendly, PVC vinyl fences can be completely recycled back into the manufacturing stream. 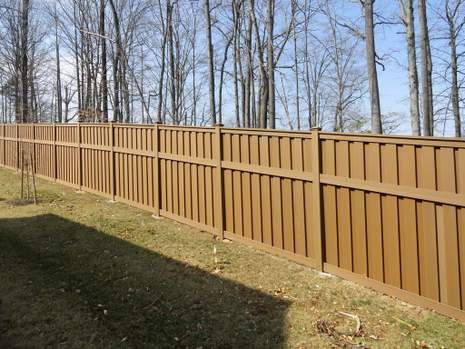 With the longest expected service life in the fencing industry, you will never again spend days painting or staining a vinyl fence in Burke, VA – it won’t split, splinter, warp, deteriorate, rot or be so much as even looked at by an insect. Polyvinyl chloride, more commonly called PVC, has been used to manufacture exterior siding, decking, and vinyl fences since the 1970s. When first introduced vinyl fences did not perform as well as wood or metal under extreme temperature fluctuation. Due to rapid advances in molecular chemical technologies, today’s vinyl fences hold up beautifully in cold Northern Virginia winters and blistering Virginia heatwaves. For more information and design tips on vinyl fencing in Burke, VA, contact Hal Co Fence Company. Established in 1981, Hal Co Fence has installed thousands of fences for satisfied homeowners throughout Northern Virginia. If your property can benefit in a multitude of ways from a secure, attractive, durable vinyl fence in Burke, VA, contact the fence professionals at Hal Co. We work with homeowners to compare, select, plan, and install the most cost-effective vinyl fence in Burke, VA that makes the most sense for their landscape investment dollars. This entry was posted on Friday, August 29th, 2014 at 2:30 pm	and is filed under Fences, vinyl fence. You can follow any responses to this entry through the RSS 2.0 feed. Both comments and pings are currently closed.